When I received a review copy of Cuban Flavor: Exploring the Island's Unique Places, People, and Cuisine by Liza Gersham, the photos immediately began to tell the story. My first reaction to the book was that it was going to make me want to travel. I wanted to see the sights and taste the food in Cuba. But, as I started reading and becoming more informed about current life there, I realized that tourism brings as many problems as solutions. Food scarcity among Cubans is common, and ration books for food tend to last for only part of a given month. A lot of the food supply is taken by restaurants serving the tourist trade where higher prices are paid. So, I began to wonder if visiting is a good idea. I found an article that describes both sides of the conundrum, and it does a good job of pointing out ethical ways of traveling. Staying in a home via a service like Airbnb and visiting paladares, or restaurants created in homes, can more directly benefit families. Also, bringing supplies to share with locals is a good way to help slightly alleviate needs. Being mindful of the local situation helps in making the best choices you can as a visitor. And, without even leaving home this book transports you to the island with recipes and stories about their origin. There are recipes for beef although it’s pointed out that access to beef is a rarity. The Carne con Papas stew is a dish from a feast served at the Finca Agroecologica El Paraiso. There’s a chapter just for chicken and another for fish. The Shrimp Tamales and Empanadas Decameron both got my attention. In the Vegetariano chapter, it was interesting to read that organic farming in Cuba is common because it’s a necessity. The farmers don’t have access to pesticides and are coming to realize the benefits of growing food without chemicals. Among the desserts, the Chocolate Rum Ice Cream and Guava Sugar Cookies both sound delicious. And, several of the cocktails would be fun to sample. 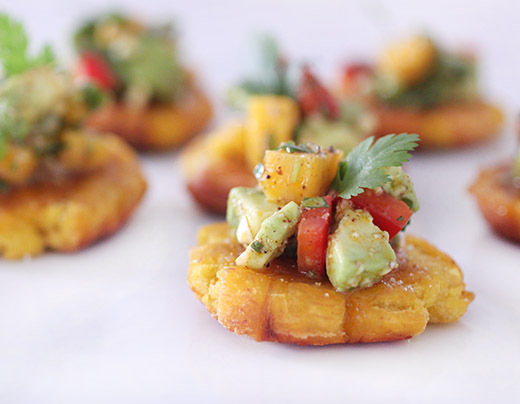 It had been ages since I’d made tostones, though, and I had an idea to use them as bases topped with salad to serve as little appetizers. Making tostones is a fun process. The hardest part is peeling the green plantains. Once they’re peeled, you slice the plantains into thick chunks and fry them for a few minutes on each side. After the first frying, the plantain pieces are drained on paper towels and mashed while still warm with a spatula. They crush easily and smoosh down to about a third of their original height. Then, each piece is fried again for just about 30 seconds per side. After draining on paper towels a second time, the tostones are sprinkled with salt and are ready to serve. I also made the Mango and Avocado Salad from the book. The dressing was a mix of olive oil, lime juice, cilantro, ground achiote, minced garlic, and salt. A red bell pepper, a mango, and an avocado were diced and tossed with minced onion and more cilantro before the dressing was added. I cut all the salad ingredients small so they would fit better on top of the tostones. I felt more than a little guilt having read that avocados in Cuba can cost almost as much as a laborer’s day’s wage when they can be found at all. Avocados are enjoyed and shared when available. I kept that in mind and enjoyed every bit of this salad on the crunchy tostones. They made a great pairing, and I learned to appreciate the ingredients that are often taken for granted. Recipes reprinted with publisher’s permission from Cuban Flavor: Exploring the Island's Unique Places, People, and Cuisine . Tostones are a ubiquitous starter in Cuban restaurants. Known throughout Latin America as tachino, chatino, or plátano a puñetazo, this savory twice-fried plantain can be very filling and tasty. There are two types of plátanos that offer significantly different flavors—one variety looks more like a banana and is sweet, while the other is starchy and bigger. 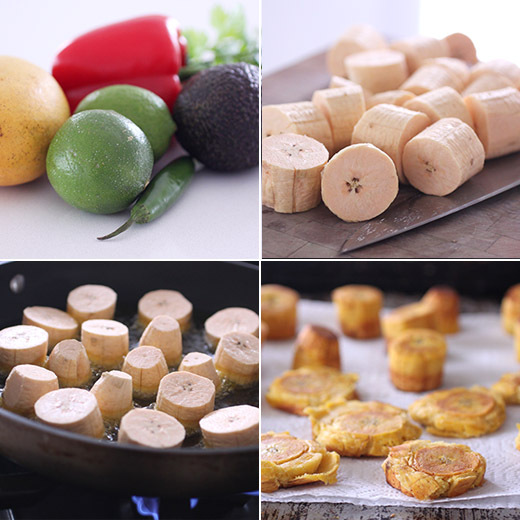 You can make chips with it, or you can boil it, mash it, and fry it to make the well-loved tostones. Peel the plantains, removing the ends. Cut them in rounds that are 1–1½ inches in thickness to make the shape of a chip. Carefully place the plantains in a pan with hot oil for approximately 7 minutes. When crisp, remove, drain, and press the plantains with a spatula to flatten until they are approximately 1/2 inch thick. Raise the temperature of the oil and add the flattened plantains again. Cook for approximately 80 additional seconds. Sprinkle with salt and serve with sofrito salsa. Add a side of sour cream if you like. Unlike Mexico’s abundance of avocados, avocados in Cuba are a rarity. Difficult to find in local markets, avocados typically cost almost as much as a laborer’s day’s wage. Therefore, when an avocado comes your way in Cuba, you covet it and share with friends. Prepare the dressing. Whisk olive oil, lime juice, cilantro, achiote, garlic, and salt. Blanch the bell pepper, and then dice into pieces. Place in a bowl and let cool. Add the dressing to the cooled bell pepper. Arrange red onion slices on a plate, and top with sliced avocados and a touch of sea salt. Pour dressing over, and top with mango cubes and fresh cilantro. 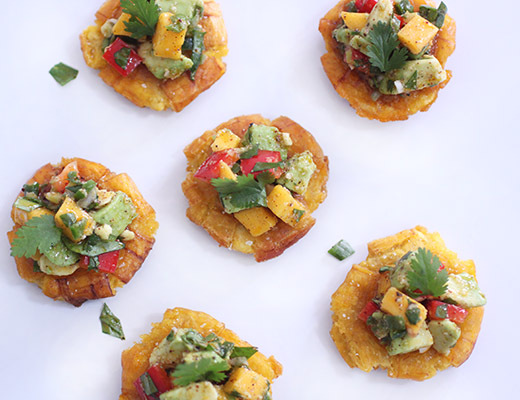 wow these plantain bites are so inviting and delicious with that refreshing salad topping! Cookbooks with a story are so rewarding. The reader learns so much more than just a recipe. This sounds like one of those rare cookbooks, fabulous! this is TOTALLY something i would love! sounds like a great recipe to represent a great cookbook! Such a neat dish -- bet these are loaded with flavor. Sound like a terrific cookbook, too. Thanks!